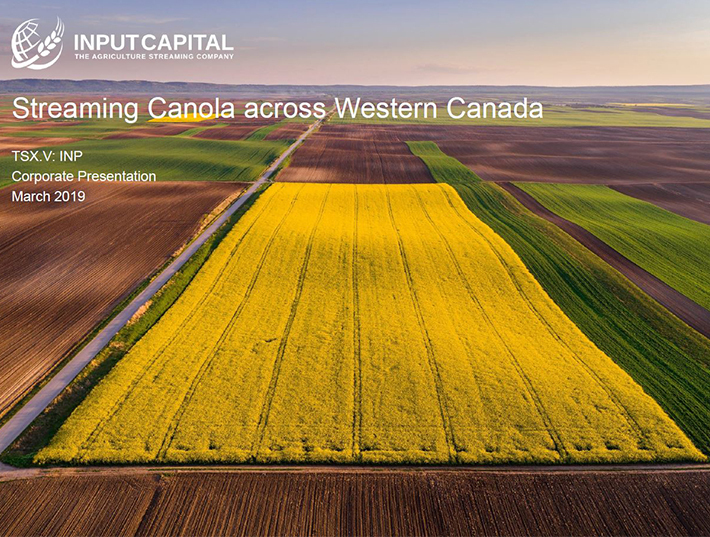 REGINA, Oct. 11, 2017 /CNW/ - Input Capital Corp. ("Input", or the "Company") (TSX Venture: INP) (US: INPCF), is releasing its quarterly operations update for its quarter ending September 30, 2017, which provides a summary of capital deployed in the acquisition of new canola streams and a preliminary summary of canola sales during the quarter and year ended September 30, 2017. The final accounting of quarterly and year-end results will be published in Input's audited year-end financial statements and MD&A when these are finalized and released in due course. "An early and generally smooth harvest has allowed Input to record its best quarterly adjusted streaming revenue since the fall of 2015," said President & CEO Doug Emsley. "Good weather contributes significantly to early canola deliveries, and this year's strong finish establishes a new record for streaming volume sold during a twelve month period. "In terms of client acquisition, the July to September quarter has always been the slowest quarter, reflecting the seasonality of the agriculture industry. Now that harvest is wrapping up, our sales team is prepared for a busy new season signing up new streaming contracts and expanding relationships with current clients. Over the last year, we have seen a lot of growth – today we have over 300 active streams, up from just 112 last year at this time – and we anticipate another strong year of growth in FY2018." Signed 11 streaming contracts for a total of $1.7 million in capital deployment during the quarter, adding 4 new producers and over 12,000 metric tonnes ("tonnes" or "MT") to canola reserves. Recorded $12.0 million of revenue on the sale of 25,333 MT of canola equivalent from streaming during the quarter, at an average price of $474 per MT. Signed 297 streaming contracts for a total of $36.8 million in capital deployment during the fiscal year, adding 199 new producers and over 300,000 metric tonnes ("tonnes" or "MT") to canola reserves. Recorded $34.0 million of revenue on the sale of 71,819 MT of canola equivalent from streaming during the fiscal year, at an average price of $475 per MT. During the quarter, Input signed 11 canola streaming contracts for quarterly capital deployment of $1.7 million (compared to 10 contracts and $1.8 million in deployment in the same quarter last year). Deployment in the quarter resulted in the addition of over 12,000 metric tonnes ("tonnes" or "MT") to Input's total active canola reserves bringing total reserves to 405,000 MT. Of the 11 contracts signed in the quarter, 4 are with new clients in Saskatchewan and 7 contracts are renewals/expansions with existing clients. This brings Input's streaming portfolio to 301 active streams in Alberta (71), Saskatchewan (221) and Manitoba (9). For the 2017 fiscal year, Input has signed 297 canola streaming contracts for total gross upfront payments of $36.8 million. This compares to 89 contracts signed for total upfront payments of $25.8 million during the same twelve month period last year, increases of 241% and 43%, respectively. Input sold 25,333 metric tonnes ("tonnes" or "MT") of canola equivalent volume from streaming during the quarter at an average price of $474 per MT, for quarterly streaming sales of $12.0 million. This compares to 15,916 MT sold in the same quarter last year and represents Input's strongest quarterly streaming sales achievement since the fall of 2015. An early harvest and mild weather supported Input's robust start to deliveries from the 2017 harvest. Strong canola sales are expected to continue through Q1 and into Q2 of the 2018 fiscal year. For the year, Input sold 71,819 MT of canola equivalent volume from streaming for an average price of $475 per MT, representing a 33% increase in volume sold over the comparable twelve month period. This quarterly operational update will be the final such quarterly operational update published by Input. Starting in F2018, deployment and canola sales figures will be released in conjunction with quarterly financial results.